Hey guys, back again and we’re talking about Black Panther. As this really needs no introduction, let’s get right to it. No spoilers ahead. So where do we even start? This movie was amazing. And you don’t have to take my word for it, either. It’s already smashed expectations left, right, and center and just domestically has, in four days, outgrossed the total domestic hauls of other ‘heavy hitter’ movies of the genre (and outside it). 242 million dollars over the four day weekend. This is the kind of bank reserved for only a very few movies (mainly those with lightsabers in them). 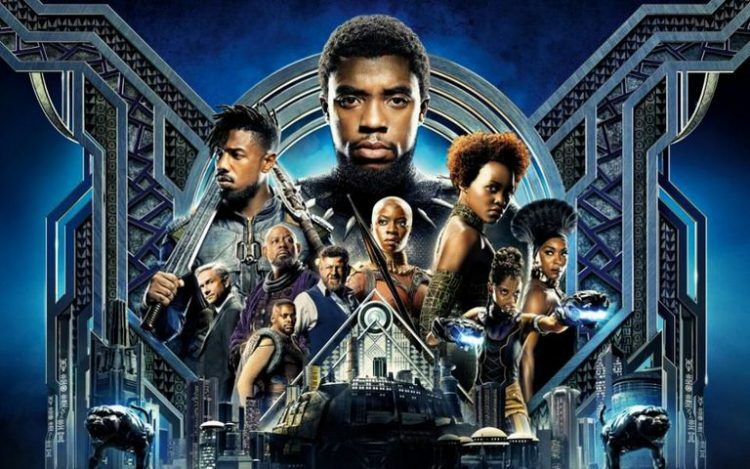 It is so awesome to see Black Panther get that kind of love from audiences, because it’s a really important movie. Black writers and director and an almost entirely black cast of incredible talent. I can’t speak to how it resonates with audiences in that sense, but I can tell you that I was hoping this movie would kill it at the box office and it went past my wildest expectations. I can tell you the Black Panther hashtag on Twitter was on fire this weekend with people sharing their experiences and their feelings on the movie. It was beautiful to watch. Okay, is there really anything I need to say about this movie? Based on box office alone, chances are everyone’s seen it already. I’ll just outline the pertinent points because writing this as a proper review just isn’t working. -Now when I said this cast was stacked, I meant it. The caliber of talent here is just mind-blowing and everyone brings their A-game. 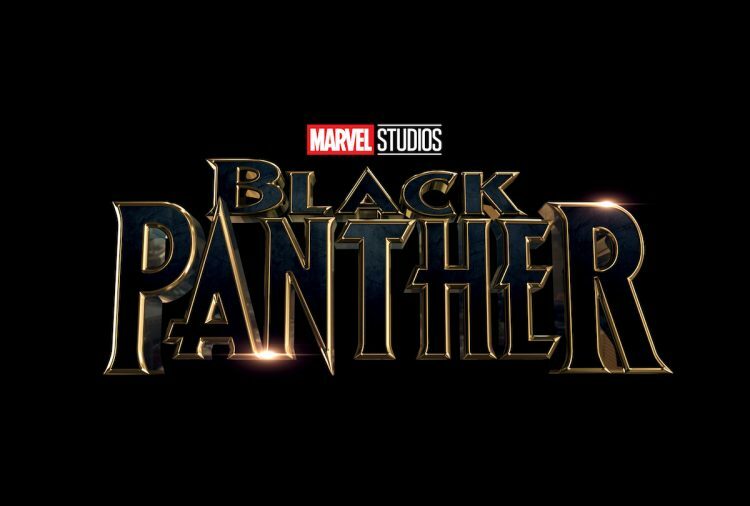 The two standouts have got to be Letitia Wright as T’Challa’s awesome younger sister Shuri, and Michael B. Jordan as antagonist Erik Killmonger. I also loved seeing Daniel Kaluuya in a film again and I’ll say the same thing I said after Get Out: put him in more things. -Wakandan women are powerful and I’m all about that. 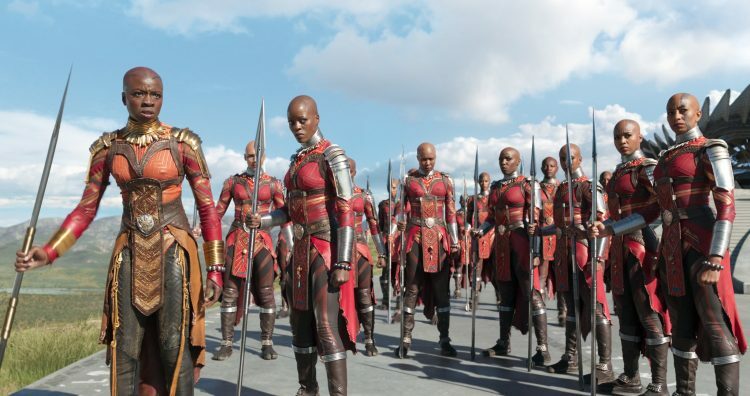 I’m especially a fan of the Dora Milaje and their General Okoye (Danai Gurira). And Shuri was just this super-adorable badass genius that was amazing. -Great music. The score is so good, and it really gets you into the feel of the movie. I’ve tried listening to some of the soundtrack album as well. It’s not really my style, but it’s pretty good, too. -Stunning visuals. Wakanda looks gorgeous. All the costumes are gorgeous. It’s just gorgeous to look at. -One of the better Marvel villains. MCU films always seem to fall short in the bad guy department. Killmonger is one of the exceptions. You can understand him and where he comes from, you can sympathize with him, even if the way he’s going about things is terrible. Again, Michael B. Jordan’s performance really knocked it out of the park. -It was a hero’s journey story, but one that was grounded in some serious issues of today. And it never backed away or down from those issues and putting them out there. -the two token white guys. 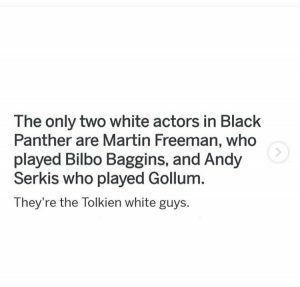 I love Andy Serkis, full stop, and Martin Freeman is almost adorably grumpy by default. - The only downside? There’s maybe one. Since you’re getting the ‘hero’s journey’, or at least ‘the hero’s rise to power and cementing who they are’, I didn’t really find any part of the story surprising. It more or less went the way I expected it would. But in this case, it’s more about how the story is told than what the story is. -And don’t leave when the credits start. Marvel movie, right? Don’t leave until the bitter end. So, there you have it, my thoughts on Black Panther. It’s good, it’s really, really good. If you’re one of the few that haven’t seen it yet, you should. This entry was posted in Movies and TV and tagged 2018, anticipated, Marvel, movie review, movies, reviews. Bookmark the permalink. thx. It’ll be awhile, but I’ll watch. Something bothered me (green screen showing, the dumb thing about using close-combat weapons), but otherwise, it was a great movie, but also a movie you can talk about a lot. I’ve seen scores of interesting reflexions about it. It may be a (gorgeous) superhero movie, but it’s one you can talk about with your smart, non-nerd friends.